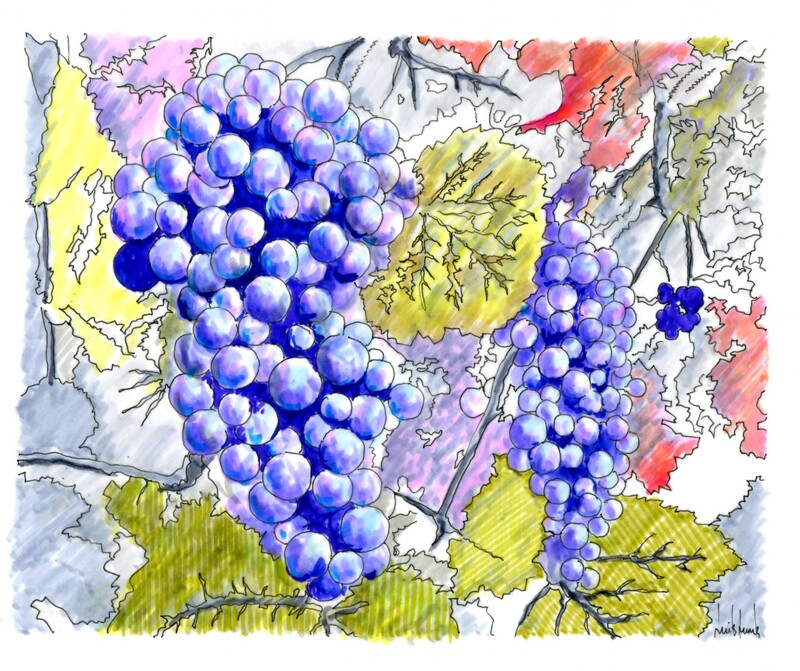 Touriga Nacional, Rui Barreiros Duarte, ink on paper, 2012. There is a Portuguese saying, “muita parra, pouca uva,” (leafs are many but grapes are few) that applies to Touriga nacional. This varietal has very small grapes. But they burst with flavor through a thick skin that gives the wine an intense red color. Touriga has been planted for centuries in the Dão region but has little name recognition outside of Portugal. If you are a wine lover, it is worthwhile to learn how to say Touriga nacional (toereega nacional), because this grape is destined for stardom. So, when the Touriga frenzy takes over the world, you’ll be able to say: I drank those fantastic Touriga wines when they were great buys because almost no one outside Portugal knew about them. I am Touriga Nationaled out today just had 13 different wine tasting at Vini Portugal with my Californian wine tourist couple – now I know that all & Toureegas are not the same – Dao is by far the best terroir! E faça-se um brinde ao grande jogo da selecção com o fantástico vinho do Dão. Não há dúvida que a combinação é excelente. Cheers!